Salary: - INR Rs. 15600 - 39100/- With 6600/- Grade Pay (Post 1), Rs. 9300 - 34800/- With 4800/4200/- Grade Pay (Post 2). 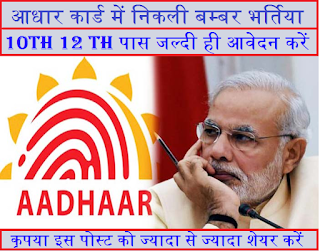 How To Apply: - All Eligible Student Need to Download application Form through official website http://uidai.gov.in. After Filling The application for the candidate must send hard copy of application along with relevant testimonials (Mentioned In Detailed Advertisement) to the following Address before or on within Last 45 Days. Address to Send Form: -Asstt Director General (Admn), Unique Identification Authority Of india Regional Office, Ministry Electronics & Information Technology, 1st Floor, RIADA Central Office Building, Lowadih, Namkum industrial Area, Ranchi – 534010.